Project Description: Building on the success of work completed as part of the Town of Mammoth Lakes Trail System Master Plan Update and the Sherwin Area Trails Special Study (SATSS), the United States Forest Service (USFS), the Town of Mammoth Lakes (TOML), and MLTPA invited the community to form an independent working group in the spring of 2009 to collaboratively identify a preferred alternative for trails, public access, and recreation facilities for implementation in the territory immediately to the south of the Town of Mammoth Lakes, best known simply as the Sherwins. The group came to be known as the Sherwins Working Group (SWG). Seventy-one people attended at least one of the SWG's 26 total meetings, held between March and November 2009, with approximately 25 to 30 individuals making up the core work group. 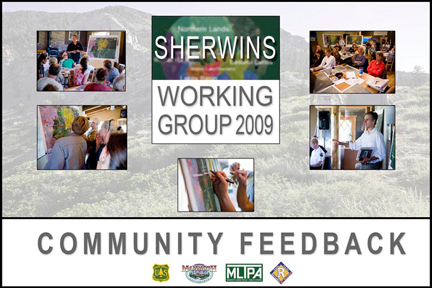 These community members represented a broad spectrum of recreation, business, and agency interests in the Sherwins area and worked intensely and collaboratively to craft the SWG's ultimate deliverable: seasonal recreation proposals for the Sherwins area to be delivered to the TOML and the USFS in the fall of 2009. The group met its target date on November 3, 2009, coming to consensus on not only the Winter and Summer proposals, but also the accompanying framework document, preamble, and appendices. Collectively known as the Sherwins Area Recreation Plan, or SHARP, this document represents the road map for project implementation by the Inyo National Forest, the Town of Mammoth Lakes, and their partners. Project Status: SHARP was adopted by the Town of Mammoth Lakes as part of the Town's updated "Trail System Master Plan" in October of 2011. The programmatic CEQA analysis was completed with funding from a grant to the Town of Mammoth Lakes from the Sierra Nevada Conservancy (SNC). In the Summer of 2013, the first SHARP trail - #12B - was completed by volunteers working with the Summer of Stewardship Trail Days program and also in the summer of 2013, the Town contracted with the Inyo National Forest through a Challenge Cost Share Agreement using Measure R funds to begin the multi-year process to complete the environmental analysis necessary to begin building additional SHARP trails. In 2017, the Mammoth District Ranger authorized construction of two new trails in the Sherwins – the Mammoth Rock Trail Connector (SHARP ID S13) and the Meadow Trail Connector (SHARP ID S18) and the Town initiated contract efforts for field studies to inform NEPA and CEQA analysis on an additional 20+ SHARP projects. Please visit our SHARP Project Archive page for details and to download it for your own review. If you have questions about SHARP or the Sherwins Working Group process, please email Joel Rathje, the Mammoth Lakes Trail System Trails Coordinator, or MLTPA at info@mltpa.org, or by calling (760) 934-3154. SHERWINS WORKING GROUP PURPOSE: "The Sherwins Working Group (Working Group) is an independent, community-based body of stakeholders. The primary goal of the Working Group is to develop a preferred alternative for public access for the Sherwin Area Trails Special Study (SATSS) area that provides for safe and environmentally responsible use. The Working Group seeks to minimize conflict between different forms of recreation and between recreation of all types and the environment." Meeting #8: Tuesday, November 3, 2009: Westin Hotel, 4 p.m. to 7 p.m.
Meeting #7: Tuesday, October 13, 2009: Sierra Meadows Ranch; 4 p.m. to 7 p.m.
Meeting #6: Tuesday, September 22, 2009: Sierra Meadows Ranch; 4 p.m. to 6:45 p.m.
SHERWINS WORKING GROUP COMMUNITY FEEDBACK PROCESS: Over the last five months, the SWG has been hard at work crafting draft proposals for summer and winter recreation opportunities in the Sherwins area (public lands adjacent to the southern portion of the Town of Mammoth Lakes Urban Growth Boundary). Now, from September 11 through October 1, you have a chance to thoroughly review their work to date and provide your feedback via the Sherwins Working Group Community Feedback Process! Click here to learn more. Meeting #5: Thursday, September 3, 2009: Sierra Meadows Ranch; 4 p.m. to 7:15 p.m.
Meeting #4: Tuesday, August 11, 2009: Mammoth Lakes Library Ellie Randol Reading Room; 4 p.m. to 7 p.m.
Meeting #3: Tuesday, July 14, 2009: Sierra Meadows Ranch; 4 p.m. to 7 p.m.
Meeting #2: Tuesday, June 16, 2009: Sierra Meadows Ranch (old Sherwin's Restaurant); 6 p.m. to 9 p.m.
Meeting #1: Saturday, May 9, 2009: Ellie Randol Reading Room at the Mammoth Lakes Library; 10 a.m. to 4 p.m.
SHERWINS WORKING GROUP BLOG: Click the image to the left or go tohttp://mltpa.wordpress.com to visit the SWG blog. This is quite a useful tool for setting up field trips and between-session meetings, as well as for general discussion! Winter Field Trip #2: Saturday, April 4, 2009: Sierra Meadows Ranch, 9 a.m. to 11 a.m. and 2 p.m. to 4 p.m.
Winter Field Trip #1: Saturday, March 21, 2009: Sierra Meadows Ranch, 9 a.m. to 11 a.m. and 2 p.m. to 4 p.m. PHOTOS: MLTPA has prepared these photo galleries from four of Mammoth Lakes' peer resources.